Having grabbed the 2nd spot in Ligue 2, Amiens SC have secured their very first season in Ligue 1. And along with the team, France's top league will welcome one of the most unique stadium. 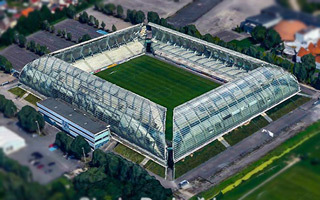 You may not recognise it by name of Stade de la Licorne (Unicorn Stadium), but the structure built in 1999 is instantly recognisable by its looks. That's due to its roof which isn't really effective as a roof due to its extraordinary height. It works as wind protection though. Now that Amiens SC are bringing the stadium to nationa spotlight, the municipal authorities need to also bring it to Ligue 1 standard. After almost 20 years in operation the first major redevelopment is taking place, worth an estimated €9 million. As part of the works, all of the stadium's famous glass cladding will be removed. Not because its stained, though it is, but due to safety concerns. Should any piece fall, it could pose serious threat to lives of spectators. That's why in new layout only the lowqer panels will be made of glass, upper ones are to be lightweight ETFE. While the season begins in mid-August, the east stand will only be ready in September or October, later followed by similar changes in other areas until 2018. That's why Amiens SC have come up with a plan to not lose on capacity during the works. They will erect a temporary stand for 1,500 people. Now, as of Sunday, the club is running a crowdfunding campaign in order to secure €100,000 from fans. This would cover all costs associated with the stand, which alone (with its cover) costs €83,000 and needs to be transported and assembled. One issue raised by local France Info tv station is that the temporary stand is already bought. It was bought on behalf of Amiens SC from the liquidated Evian football club. It's currently in posession of Christophe Richard, chairman of amateur team US Camon. Camon bought the stand specifically with the intention of transfering it to nearby Amiens once the money is raised.